I used to do a vegan version of a roasted tomato soup. But since I'm eating meat again, I updated my old recipe. And for the better, I have to say! This soup is amazing. The base is a bone stock, made from beef shank. 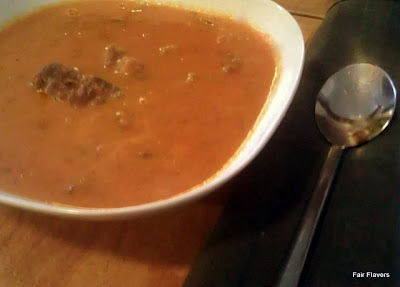 Then flavored with roasted tomatoes and herbs and finished with super tender shank meat and a good dollop of heavy cream. Roasting the tomatoes gives them loads of extra flavor. 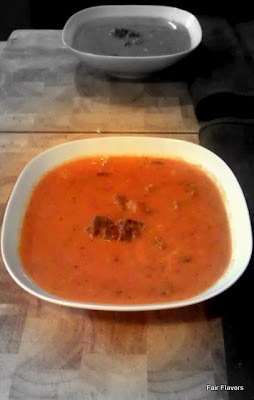 If you make this soup using the home made shank stock, it takes quite some time to make, but it's really cheap (because shank, at least in my country, costs next to nothing compared to other stewing cuts), easy and very, very (did I say very yet?) tasty! Of course, you can take a short cut with a beef stock cube, and some sausage. But try roasting tomatoes for soup, that's really worth the effort! 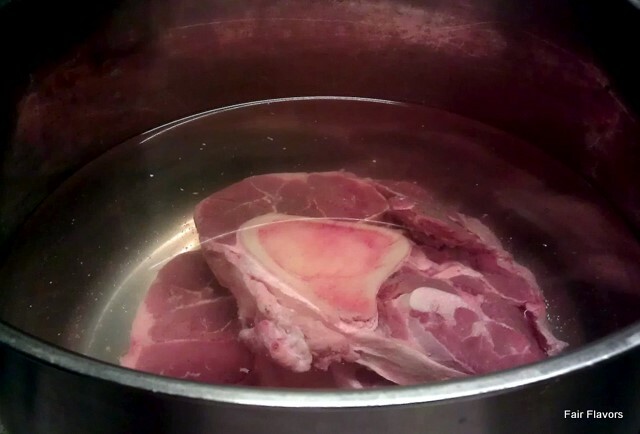 First, you make the stock(or broth, or whatever you call it in English. I can't figure out the difference :-)). Put the shank in a pan and cover with the water. I use nothing for flavoring, because I don't really care, since the tomato mixture will bring all the flavor later. Bring it to a boil, cover and let it simmer on very low heat for 4-5 hours. I like 5 hours, because I want the meat to be as tender as possible. The liquid is probably reduced by this time, to roughly 1 quart (or 1 L.), which is good, because that's the amount you need for the soup. Take the meat out of the liquid, let it cool for half an hour and take the meat off the bones. I usually dump the marrow back in the broth and keep the meat aside. Preheat your oven to 475 F (250 C). Cut the tomatoes in half and put on a greased baking tray (or oven proof dish, just make sure that they're separated). Drizzle with a good amount of olive oil and toss until all the tomatoes are coverd in a little oil. Sprinkle the herbs, some salt and pepper on top. Crush the garlic cloves and scatter some pieces of garlic between the tomatoes. Do the same with the chopped onion. Place in the hot oven for 35-45 minutes. Keep an eye on it. You don't want it burned of course, but it's good when some tomatoes have slighlty black edges. It's probably not necessary to say that you should be careful with taking them out of the oven, but I say it anyway, because they're really crazy hot. Put the tomato/onion mix in the broth and simmer for 15 minutes, to get the flavors incorporated. Now, you can add the sweetener. Use a (stick) blender to puree the soup and put it back on the stove. Put in the meat and cream and cook slowly until the meat is heated through. This is a good time to taste the soup and determine if you want some extra salt and pepper.You can finish the soup with some fresh basil leaves and/or some grated Parmesan.